One of my frustrations with the financial markets is the unwarranted importance attached to certain data releases. I think the prime example of this is US retail sales. This has to be one of the most closely watched/anticipated data releases each month, and often results in material market moves on the day depending on whether it is a beat or a miss. What I find really odd about this phenomenon, is that while retail sales are important, they are only a fraction of overall output, they are prone to significant revision and the advance estimate is in current price (dollar) terms, and so does not adjust for inflation. I suspect the significance that is attached to it is largely down to history – when retail sales were a larger share of the economy, and there were fewer alternative indicators of growth. The “control group” for retail sales, which is what most closely maps into the national accounts measure of personal consumption accounts for under 25% of total consumption. That is because goods only make up around one-third of personal consumption, and the control group is around 70% of total goods. So the retail sales control group is around 17% of GDP, which is more than say, manufacturing on the output side of the accounts (around 12%), but clearly nothing like the sort of driver of growth that some seem to think. 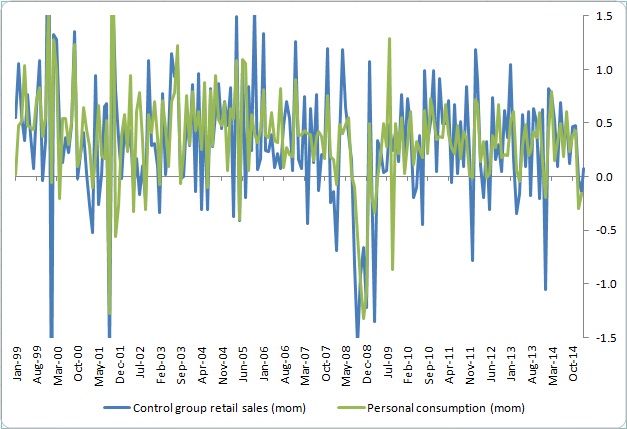 The correlation between the month-on-month growth rates in retail sales and total personal consumption is reasonably high, at 65%, but again, not so high as to take the retail sales as a definitive read on overall consumption. Last week there was a fairly large miss on February retail sales. How much does this tell us about a slowing in real personal consumption in Q1 vs Q4 last year. I would argue not a lot, because it could well be revised and there may be some unusual weather effects holding back retail sales in February. But even statistically, it is not clear. Eg, if we were to assume that retail sales bounce back in March to rise by 0.7% mom, that the other three-quarters of personal consumption continues to grow at the average rate of the past few months and the deflator rises (mom) in February, then I see real personal consumption growth of 4.4% annualised in Q1. That would be hardly any weaker than in Q4 and in absolute terms, very strong. Even if retail sales didn’t rebound much, and rose by say 0.3% mom, then I still see overall consumption of 4% annualised in Q1. That is because the other elements of personal consumption completely dominate. If they were weaker, then so would overall personal consumption and vice versa. Unfortunately there aren’t any monthly hard data sources that give an early read on consumption of services (indeed, they tend to be subject to meaningful revision after the first quarterly estimate). But proxies such as household confidence and labour market outcomes can give some guidance. The U of Michigan consumer sentiment survey for March was a little softer last week (it may also be impacted by the weather), but the Conference Board survey (only up to Feb at the moment) has been more robust, as has the Bloomberg consumer comfort measure. Meanwhile employment growth continues to be very robust. So I remain positive about the US consumer, and so will the Fed.